Check the events calendar to book your stay during one of Newport Beach's spectacular events. 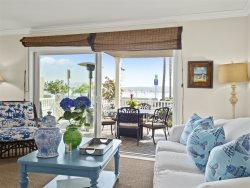 From your vacation rental's patio enjoy wine with friends while you watch Newport Beach's world famous Christmas Boat parade. Or rub elbows with some of Hollywoods elite at the anual Newport Beach Film Festival. Watch the spectacular world famous Christmas Boat Parade from your Casa de Balboa Newport Beach Vacation Home. Join over a million viewers as you watch beautifully decorated yachts, boats, kayaks and canoes sail along the harbor in the 109th Annual Newport Beach Christmas Boat Parade. As Newport Beach's Christmas Card to the world, the boat parade will set the harbor ablaze for five consecutive nights, beginning Wednesday, December 19 and ending Sunday, December 23 2018. The parade starts off the tip of Lido Island at 6:30 pm and finishes at the same site at approximately 9:00 pm each evening. It passes Casa de Balboa Vacation Rentals at approximately 6:45PM. Beautiful multi-million dollar yachts, kayaks, canoes and other small boats will light up the harbor as a dazzling array of holiday lights and music fill the air at the Christmas Boat Parade. Many of the boats will be richly decorated with animated Christmas scenes accompanied by music and costumed carolers. Some boat owners in the past have spent over $50,000 to decorate their vessels for the event. The Christmas floats will wind their way some 14 miles around the harbor to give viewers in restaurants, yacht clubs, on public beaches, and in private homes an incredible sight that has delighted millions of people for a century. Serving as the backdrop for the hundreds of lighted boats in the parade is the annual "Ring of Lights" contest, hosted by the Commodores Club of the Newport Beach Chamber of Commerce. Beautifully decorated bayside homes and businesses surrounding the harbor go "all out" with their own holiday spirit, featuring everything from roof-top animated scenes to dancing Christmas trees. With its own judged categories and prizes awarded, the "Ring of Lights" has become as celebrated as the boat parade. Every year, The American Legion Newport Harbor Post 291 celebrates the 4th of July with a Boat Parade. The event fills the harbor with of boats adorned in red-white-&-blue celebrating the time-honored Old Glory Boat Parade. Every year you are in for a patriotic surprise as all kinds of boats try to outshine each other waiting for the loudest ovations from onlookers. The spirit of competition drives the participants to out-do themselves each year hoping for a trophy inscribed with “best decorated”, “outstanding music”, “finest costumes”, “most creative animation” and “greatest spirit” maybe even the Commodores Award! Newport Beach, Southern California's premier dining destination, invites you to indulge in a week of delicious dining at Newport Beach Restaurant Week! Foodies will eat their way through over 60 participating restaurants that will offer three-course prix-fixe dinner menus for just $20, $30 or $40 per person and/or two-course prix-fixe lunch menus for only $10, $15 or $20 per person. This citywide affair gives foodies the chance to explore tasty treats from fresh fish to sizzling steaks to decadent desserts and much more. Most restaurants will offer a minimum of three options per course, giving the dining community an incredible opportunity to enjoy exceptional prix-fixe meals prepared by the hottest Newport Beach Chefs!